On 3 March 2017, I was at the ASICS Singapore flagship store at Suntec City for a presentation by national 1500m runner Raviin Kumar (@runlikerav) on the latest Flytefoam series shoes to drop this season. They were namely: ASICS DynaFlyte (released last year already, but seeing an upper colour update this season), the ASICS Noosa FF, and the ASICS DS Trainer 22. I got to test out each of the shoes on their in-store treadmill. I passed on the Dynaflyte, as I already had it in my arsenal, and honestly find the upper a little too warm for Singapore weather. It was down to the DS Trainer, or the Noosa FF. The DS Trainer 22 dropped a ton of weight due in no small part to the replacement of Solyte with FlyteFoam in the midsole. It went from 9.1oz for a US9 to 7.8oz from DST 21 to DST 22. That’s a whole category jump right there. It basically jumped into the same class at the New Balance 1500v3, only it is now lighter. I generally prefer neutral shoes as they tend to be more flexible, and though I did not really notice the medial Duomax posting a whole lot during my short run in the DST 22 on the treadmill, I did notice that it has excellent forefoot grip and toe off responsiveness, likely due to the extensive forefoot DuoSole, but not a whole lot of cushioning. In essence, it felt more like a stability racer than a trainer at this stage. The Noosa FF has no medial posting, and as such, it is for all intents and purposes a neutral shoe. The stack heights for the Noosa FF are 24mm in the heel and 14mm in the forefoot (vs 20mm/12mm for the DynaFlyte), so a little more stack all around. During the initial selection process on the treadmill, I liked that the shoe fit my foot volume very well, and very good vibration dampening effects. These were enough to sway me towards choosing the Noosa FF for testing. I should add that I never used the previous Noosa Tri extensively. I tried it out a few times in the store, but the shoe felt stiff, and a little dead in the forefoot, and so I never bought it. I think the first thing most people notice is that the upper of the Noosa FF went in a very different direction from the graffiti splash-job of the Noosa Tri. From what I understand, opinions are polarized on the new design. I personally like the understated looks of the upper a lot. I suspect it helped a ton with making the upper extra breathable as well. There is a lot of structure around the heel-cup, and a very solid internal heel counter at the rear. There is a pull tab at the back, made of a high-grip material, and the same high-grip material is used at the tongue, for quick slip-ons in transition (this is a triathlon shoe after all). The “star” shaped motif serves to provide some structure at the midfoot, but otherwise the rest of the shoe is made of a very high ventilation mesh. I should point out that this mesh is not of the stretchy, soft ilk, but a more rigid inelastic blend. I suspect there is a high nylon concentration in this mesh, as there is essentially zero water retention in this upper. You can just see for yourself how ventilated the shoe is. 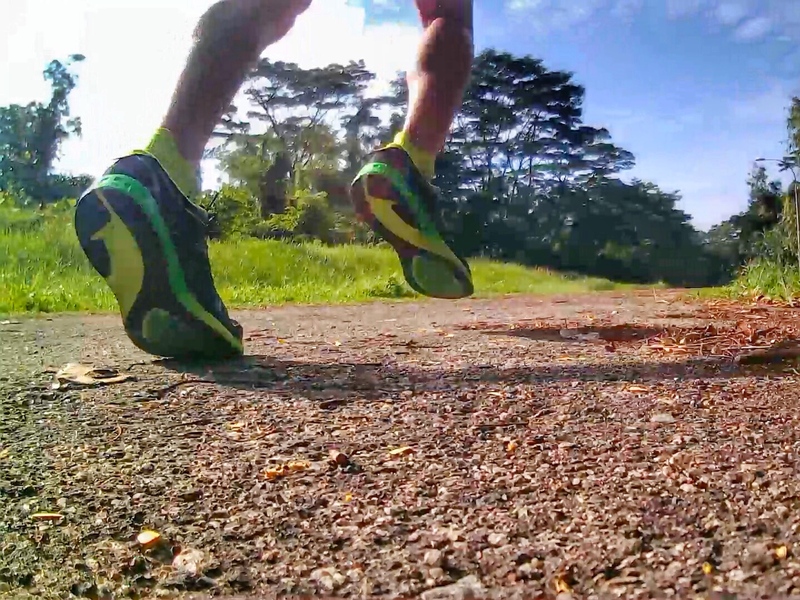 When I run into a breeze, I can feel my socks cooling as I stride forward. The inner surfaces of the upper are supposed to be seamless, but unfortunately, I haven’t run sockless for long distances since my last short course triathlon, and see no point in taking such risks in training, so you will have to try it out for yourself to see if it will work sockless. Personally, I see this shoe as more of a Half Ironman or Full Ironman distance shoe, and there are probably lighter, faster shoes you can get away with for the short course rubber burners. The insole is again highly perforated and designed for minimum water retention. The laces that came with my Noosa FF are conventional laces, but I am told that in stores, the Noosa FF will come with the option to use elastic lock-laces to make slipping on shoes in transition faster. The Noosa FF comes with a full length FlyteFoam midsole. FlyteFoam is ASICS’s latest midsole technology, and uses organic fibres to binds EVA molecules together to improve durability. The heel and sides of the midsole are beautifully designs with a 3D pattern of the words NOOSATRI followed by a run-bike-swim motif (from left to right). I wanted to draw attention to this because there are midsole designs, and there are midsole designs. 90% of the time, a fancy midsole external design is achieved by compression molding EVA as it is technically easier to achieve consistent QC in the external shape. Conversely, injection molding EVA requires injected a compressed foam into a mold and letting the EVA expand to take up the shape of the mold. This increases the risk of having small “flaws” in the external shape, in case there is a small space that the EVA did not expand into. (If your name is Dimension Six, and you have deep pockets, you can injection mold your midsole and laser etch every single LunarEpic sidewall, but for most shoe companies this is a huge cost for not much upside) Why did I bring all this up? Well, I confirmed with ASICS that the Noosa FlyteFoam is not compression molded. That makes it extra impressive to me, that they could come up with this elaborate midsole sidewall motif. You will notice in the Noosa FF that, unlike the DynaFlyte, there is no pebax plate at the medial part of the shoe, also known as a medial shank. The shank is present in the DynaFlyte to add a little medial stability to the shoe, even though it is strictly speaking a neutral shoe. The outsole doesn’t have a lot of rubber, and while this may take away from its long term durability, it also serves to amplify the vibration dampening and high rebound properties of the FlyteFoam. The black rubber is ASICS's durable AHAR carbon rubber, while the green rubber is blown rubber. I suspect one of the reasons the DynaFlyte did not work so well for me is because the thicker outsole rubber transmitted more road vibration and beat me up a little over longer runs. One clever thing you notice on the outsole is how the rubber extends along the medial and lateral edges of the forefoot. This is done deliberately to create a bit more stability in the forefoot. The forefoot blown rubber (green) also has very high grip properties and allows for a very surefooted stride as you transition through the shoe. The Noosa FF is a lightweight trainer/racer built with triathlon racing in mind, complementing the light and faster HyperTri. With that in mind, the Noosa FF was never going to be a super soft, cushioned shoe. While it is not the softest lightweight trainer I own, it does an admirable job of attenuating ground feel and dampening vibrations from the ground up through the legs. When I first put on the shoes, I immediately noticed how firm the internal heel counter was. I am generally not a fan of hard heel counters, but in this case I soon recognized how important it is for slipping on the shoes in a hurry in the heat of competition. If the heel is too soft, it easily collapses under load and makes it harder for you to get the shoe on. As it is, it acts like an invisible shoe horn that allows you to slip your foot in very easily, with the help of the heel tab. The rigid heel is somewhat noticeable during the first few kilometres, but you soon forget about it once you settle into your stride. The upper mesh continues to feel somewhat rigid even after several runs, but does not cause any irritation to my feet with thin socks. I do not know if this will pose a problem for people who wish to run sockless. Again, the mesh is extremely well ventilated and is something I’ve really grown to enjoy on hot morning runs. Also, there is very little water retention in the shoe from the mesh and insole, making this shoe ideal for both wet rainy days, and the hot days when you are sweating buckets. Additionally, I want to highlight that this shoe has pretty good wet grip, which surprised me a little since its outsole is fairly smooth and flat. I went over a few wet drainholes on the rainy days and never felt unstable when i stepped on them. Being a single density midsole shoe, the ride is predictably smooth, and despite the 10mm heel-to-toe drop, I find there is plenty of padding under the forefoot for a nice cushioned toe off when I pick up the pace. That said, the cushioning is still most evident when heel-striking to take advantage of the solid 24mm heel cushioning. I’ve done mostly easy runs in the shoe with the odd pick up of pace, and one very solid hilly long run in the shoe, and posted a time 90seconds faster than when I was preparing for the NYC Marathon and Dubai Marathon, in warmer conditions, so the shoe definitely can offer adequate cushioning for long runs, a big rarity for me. I’ve used Hokas almost exclusively for my long runs for the past few years, and only a handful of “traditional” shoes have ever gotten me through a long run without issues: Brooks Green Silence, Brooks PureCadence 3, Nike LunarGlide 3, Skechers Razor, and now the ASICS Noosa FF. As you can see, that’s a really short list. It takes a lot to impress me on a long run. The Skechers has a much higher shoe volume, and would work much better for people with wider feet. The Noosa FF has better vibration dampening than the Razor (surprisingly), and offer less ground feel as well. It is also a full ounce heavier, so not necessarily a fair comparison (Razor is ~218g vs 246g for Noosa FF) Aesthetically, it’s a tie for me. Both get mad props for style. The Noosa is also US$140 vs US$120 for the Razor. Overall, I think the Razor may have the slight edge, but it is a very close fight, and a very encouraging sign for what ASICS will produce in the future. Very similar stack heights for both shoes, and both use a full-length FlyteFoam midsole. The DynaFlyte has much more outsole rubber coverage, and I expect it to be the more durable shoe in the long run. With that said, the Noosa FF is a much more fun shoe for me. 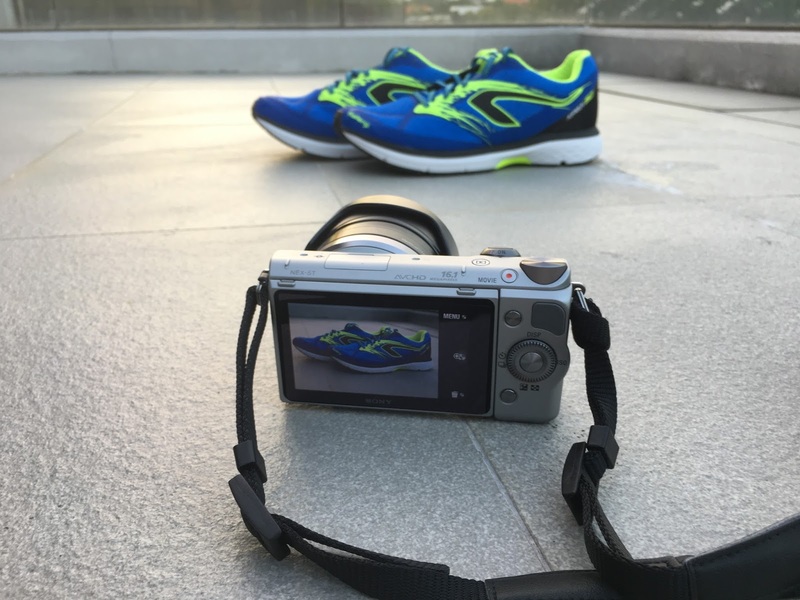 The lighter weight really shows, and it is versatile enough to handle a wide range of paces, and has enough cushioning to handle long runs, whereas the DynaFlyte tended to beat me up on runs beyond ~20km, even on sandy surfaces like Bedok Reservoir. The Boston is an overall firmer and more responsive shoe, but it also transmits more vibrations. The Boston sports stack heights of 26mm/16mm vs the Noosa FF at 24mm/14mm but somehow the Boston feels lower to the ground. At uptempo paces, the Boston forefoot feels better, offering a nice bouncy toe off, but once you slow the pace down, the Boston transitions awkwardly for me, whereas the Noosa FF retains its smoother transition. The Boston upper is slightly stretchy and more form fitting than the Noosa FF, although fit volume is on the lower end of the spectrum. Overall, I find the Noosa to be a better all-round shoe. The Boracay and the Noosa have very similar forefoot feels, and both transition very well for me. The Noosa has the softer heel and better overall vibration dampening by far, and this is really noticeable on longer runs. The Boracay has a more comfortable upper with the soft cage wrap, but the Noosa wins for breathability. Overall I still prefer the Noosa, though the Boracay is cheaper and offers very good value. Overall, it is one of the best all-round trainers I have tried in a long time, maybe even better than the Skechers GoMeb Razor for some people, which is my go-to daily trainer for the year so far. The ASICS Noosa FF is currently available at ASICS retail stores at S$199. The Asics website states the Noosa stack height at 28mm / 18mm but your article states 24mm / 14mm, am I missing something? I took the numbers off ASICS's US website. It still states 24/14. Most likely 28/18 includes the thickness of the insole. Thanks Derek - my fault, I was on a vendor website when I saw that - Running Warehouse (and a few others) show the shoe as 28/18. I've ordered to find out for myself - your review has me really intrigued about these. Thanks! Nice review ! However I had only use the Dynaflyte so far. I noticed you brought your shoes into some sandy terrains in the picture you shown, so do you find the sharp small rocks cut the under sole of your Noosa? I found couple of small holes after my first run on my Dynaflyte. I suspected the softness of the FlyteFoam causes this problem... Do you think the small holes can reduce the sole's durability? Hope to your reply soon. I have about 400km on the shoes now and almost no wear on the outsole. I do not use it on very rocky surfaces so I can't say anything about trail use, sandy paths are no problem at all. Still, thanks for the sharing Derek. Good Day! Did you have any problem with sand or gravel getting into the Noosa FF during your Bedok Reservoir run? Hi Steve, nope no issues with sand or gravel getting into the shoe. Hi derek can you plplea educate me on the dilemma to buy noosa FF or Nike winflo 4 or asics?